Big news! The Caldarian Conflict was selected for the Coffee & Books program at Dunn Brothers (currently there are only around 20 books in the program). Read on for a coupon promo! This is a very big deal–the top four books each quarter are displayed in all Dunn Bros locations. This could help The Caldarian Conflict find hundreds of new readers. As a participating author, it’s relatively easy for me to get in for readings and signing events. Buying books gets you free coffee. What better deal is there than that? To celebrate the inclusion of The Caldarian Conflict in the Coffee & Books program, I’m running a promo. 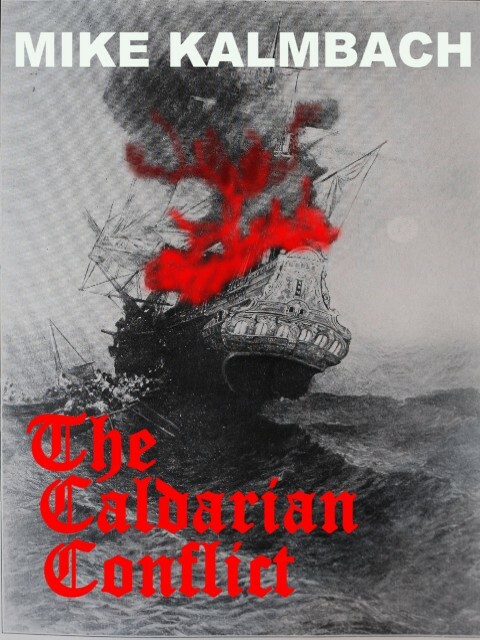 The first 50 people to buy The Caldarian Conflict ebook will receive 20% off the book! Just use the coupon code “pirate” when you check out (without the quotes). Remember, this is only good for the first 50 customers! Share this with your friends. 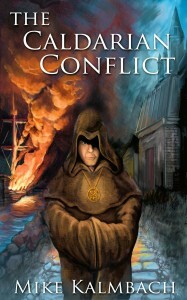 The more people who buy The Caldarian Conflict, the better my chances are of the book arriving in the store! 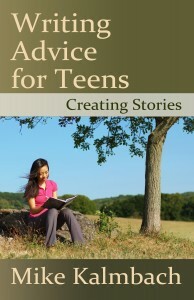 My next book, Writing Advice for Teens: Creating Stories, is now available for preorder from Amazon. I’m pretty excited! 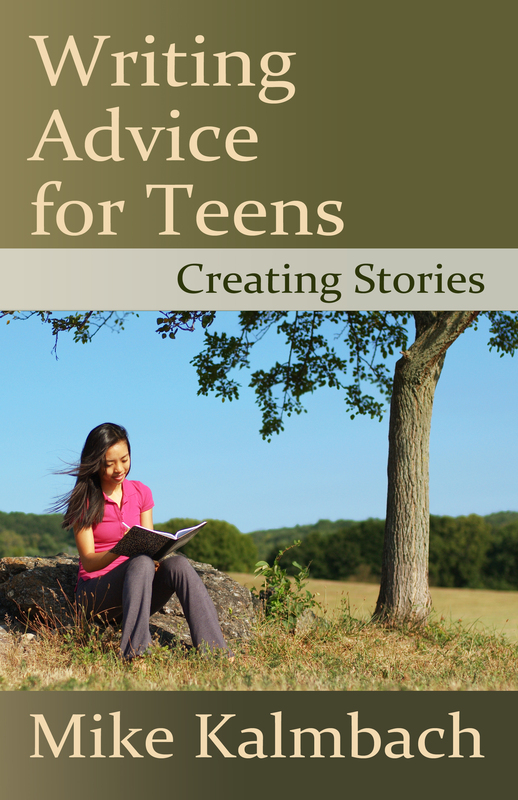 This book is the first in a series of non-fiction books designed to help teen writers through all the stages of writing, from creating stories to writing as a career. It’s great for new writers of all ages, and is organized into an easy-to-read format with plenty of examples and exercises. As well as accepting preorders through Amazon, I’m also looking for early reviewers who will read the book and write a review in time for its April 24 launch. Readers will receive a free PDF of the book, and as might be obvious, should not distribute the file to anyone else. Simply comment on this blog post, post a message on my Facebook Author page, or send me a tweet via Twitter (@mikekalmbach). If you’re on Goodreads, take a moment to add Writing Advice for Teens: Creating Stories to your to-read list. Thanks for helping get a new book off the ground! I’ll be there (and dressed as a pirate) from 10am-3pm. My books will be $10 apiece. 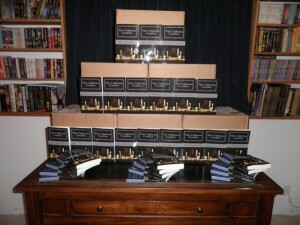 Yesterday, I hosted a launch party for my debut novel, The Caldarian Conflict.Â I invited virtually everyone I knew within a 50-mile radius to come to the signing event hosted at a local Rochester MN attraction, the Plummer House.Â Overall, it was a huge success from my standpoint, with sales exceeding expectations. As such, I want to share what I learned with others and record what happened so I can hopefully repeat the success next time. 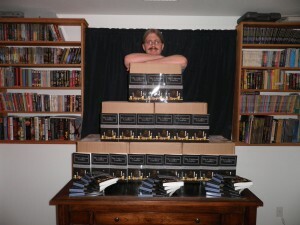 Since my own book launch was the first I’d ever attended, I had little information to go on when my wife and I planned this event.Â Brenda found lots of ideas, and we talked about a lot of different options.Â What follows is a list of decisions, why we went with it, and what I think about it now. The Minnesota Writers Alliance newsletter included us in their event list and included an excellent article about me. Timing was pretty easy.Â After I’d written the first couple of chapters of my novel, I knew I was going to finish.Â I set a target completion date of September 19, 2011–which is International Talk Like A Pirate Day.Â Since my novel has a pirate theme, it was a perfect fit. The pirate theme allowed us to have a second reason to celebrate the day: if nothing else, we could have a Pirate Day party.Â This helped create another reason for people to say yes to coming.Â Plus, since it related to the theme of the novel, we were also pulling in the target audience likely to be interested in the novel. The location was more difficult.Â Originally we wanted something located downtown so we could maximize parking ability, random walk-bys, and the likelihood that people could find the place.Â After looking at prices and a couple of options, we were concerned about the costs.Â Thankfully, Brenda came up with the option that the Plummer House and grounds could be rented for significantly less than any space we’d looked at. Though it’s a local attraction, few locals ever make the time to go up there (it’s situated at the top of a large bluff).Â This created an attractive draw for people who might have been more neutral. The Victorian feel of the house melded well with the pirate theme of the novel. Since we held the event on International Talk Like a Pirate Day, we suggested that people wear pirate costumes.Â The more remote location helped save people any embarrassment they might have felt about walking around in costume. So, in short, the location and timing was a big win that helped this event succeed. 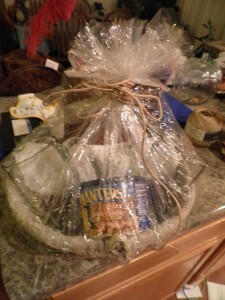 It included some cashews, a pair of mugs engraved with the title of the novel, and a copy of The Pirate Primer, so the winner could learn how to better talk like a pirate. Other door prizes were targeted for children and teens, with special consideration given to each age group.Â Being new parents, we wanted to make the event as family-friendly as possible. Also, we had lots of little gift bags, special bags for the first ones to arrive, and a free eye patch.Â My talented mother also created custom-made bookmarks for the books. We received a ton of positive feedback around all the giveaways and ideas designed to keep the party a positive experience. Overall, the giveaways were a definite win. Brenda found a plethora of pirate-themed decorations from Amazon, Oriental Trading, and others.Â We may have helped keep some of these businesses afloat in tough economic times. While we found lots of things we liked, we overbought.Â Due to time restrictions, we didn’t use all of the things we purchased. Also, for every item we put up, we extended our tear-down time at the end.Â When I release my next book, assuming we do a party, I’m planning to take a minimalist approach to decorations.Â Not only will this reduce costs, but it will also help save us time in setup and tear-down. In summary, while the decorations were cool, I think we overdid it.Â It’s an opportunity for us to improve for next time. We purposely bought much more food than we thought we needed.Â We had a few friends volunteer to make things for us, and a talented friend of ours volunteered to help make some fancy hors d’ourves.Â We had shrimp on guacamole and crackers, salmon on a custom blend of herbs and cream cheese, and many other seafood-themed snacks.Â For the adults, we included rum balls as a tasty dessert. For the kids we knew would come, we cooked pizza rolls and chicken nuggets.Â For dessert, we had cupcakes, cookies, and candy readily available. Everyone loved the food.Â A definite win, and something I’d do again.Â Next time, I might buy a little less, but I’d rather have too much food than too little.Â A side benefit: my coworkers at my day job got to help me take care of the leftovers.Â I think they’d declare it a win too. From a strict income/amount spent perspective, a launch party is not likely to be worth it for a first-time author.Â Unless you’re selling hundreds of books, the income from the party will not cover the costs. I enjoyed celebrating the completion of a large project with friends who care and want to see me succeed.Â We had a great time, and it sounds like our friends did too. I found the Plummer House inspirational.Â There are lots of story ideas lurking within those walls, and I expect I’ll incorporate some aspects of the house into future stories. This event is something I think people will talk about for a while.Â If nothing else, this party offered a great advertising opportunity–I think people will be talking about it for at least a couple weeks. We took lots of pictures throughout the night (unfortunately, I don’t have access to them right now, but I’ll update this later with pictures), which we can use to continually advertise. We loved the opportunity to have a historical landmark all to ourselves for a full day.Â What an excellent opportunity to explore! I’ve found no other way to feel more like a successful author than to have lots of people coming in to receive my autograph.Â If nothing else, this made the whole party worth it. Bottom line: This is something I’d love to do again.Â All I have to do is finish writing another book! I received the first shipment of my books today. 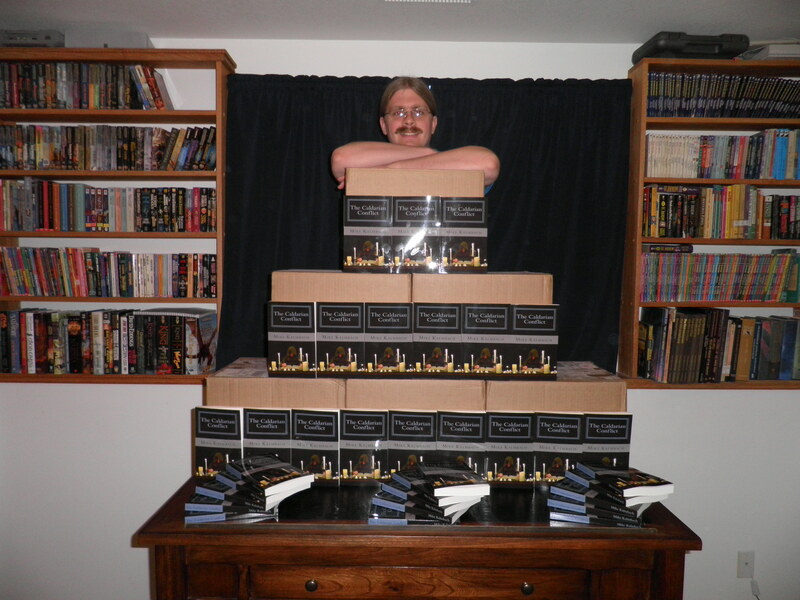 Wow, that’s a lot of books. 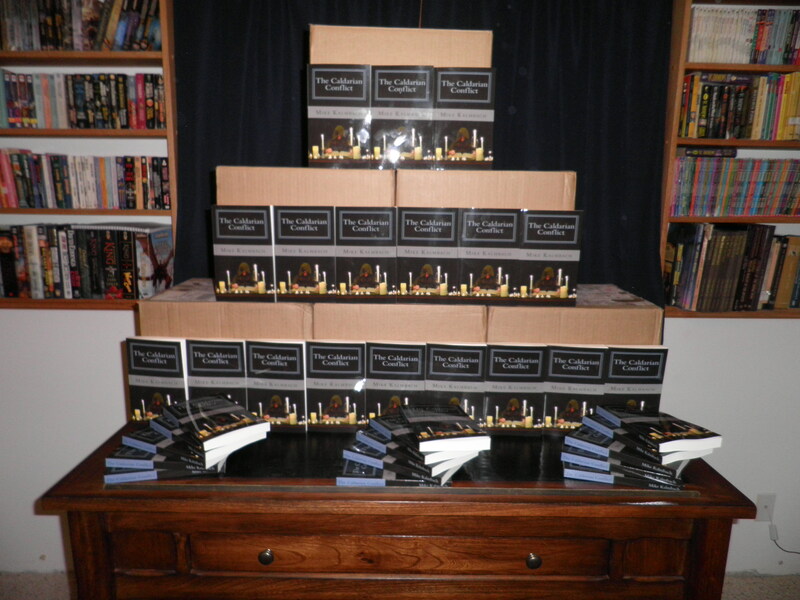 And I’ll be signing every one of them. Holy cow! I’m excited.Â Now I’m off to go sign them and get them ready for shipping! Video book trailer now available! 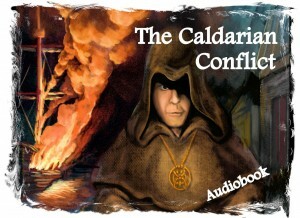 The book trailer for The Caldarian Conflict is now available. Check it out and let me know what you think! Yesterday, I received the first fan-generated art for my novel from Joan Sween.Â I think it’s a pretty cool concept, and would love to hear from other fans who want to submit pictures.Â I’m flattered that someone would take time to create art for my novel and share it with me. Wanted to share my latest press release with all of you: My novel is now available! 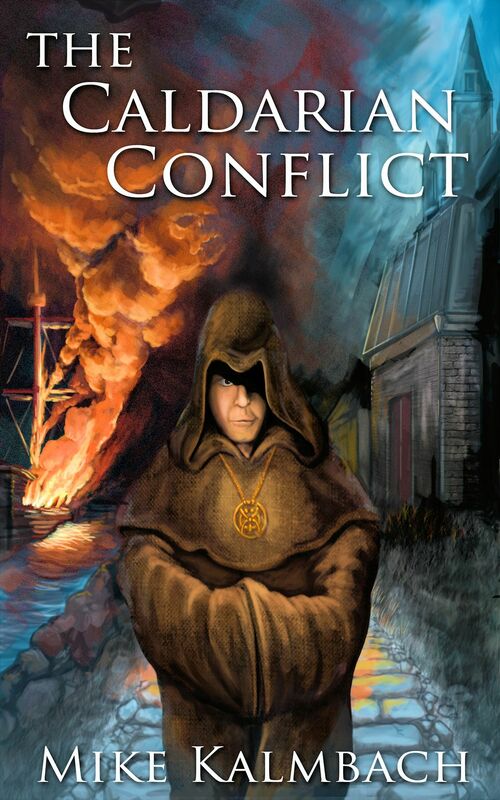 Just in time for International Talk Like a Pirate Day (September 19), author Mike Kalmbach has released his debut fantasy novel, “The Caldarian Conflict” (ISBN:978-1466246812). This isn’t your typical pirate novel. Of course, there’s plenty of swashbuckling adventure as a corrupt military deals death to enraged pirates using questionable methods. However, this story follows Brother Mendell,a monk caught in the crossfire as he seeks justice for an unfairly executed prisoner. No one is safe as Admiral Cain and his ruthless assistant Krell struggle to maintain complete secrecy over their plan. Their goal isn’t merely to rid Caldaria of pirates; they have much loftier ambitions. Anyone with too much knowledge must die. Mendell struggles to unravel the mystery before he, too, becomes a casualty of”The Caldarian Conflict”. “The Caldarian Conflict” is available at Amazon.com, BN.com, CreateSpace.com, and other channels. 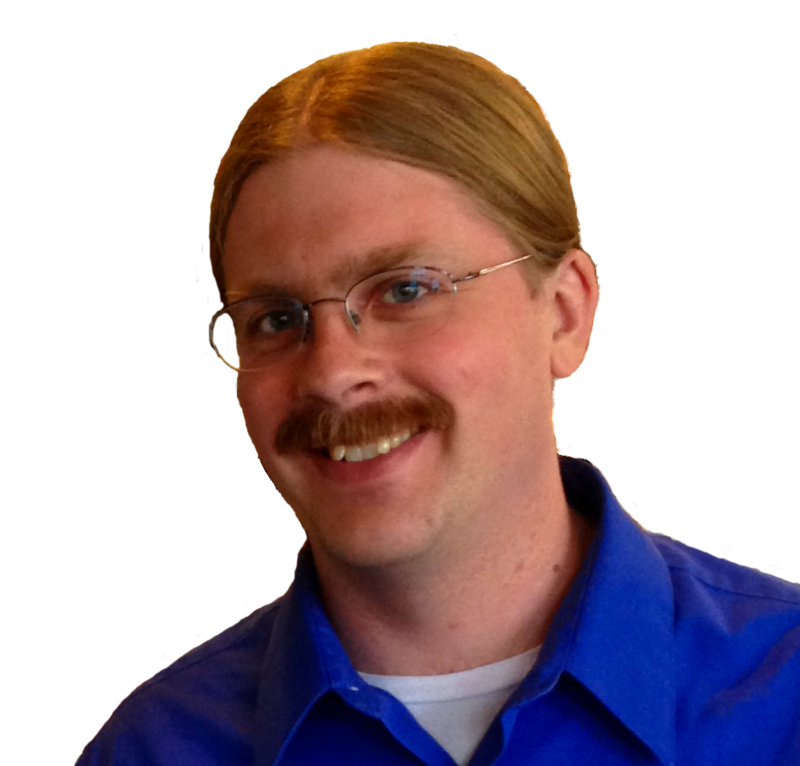 Mike Kalmbach lives in southeast Minnesota and has a Master of Science degree in software engineering from the University of Minnesota. 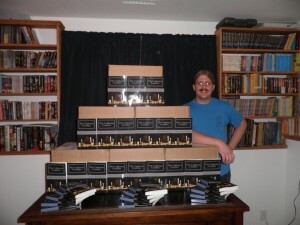 Moonlighting as a freelance editor, he has edited numerous full-length manuscripts as well as countless shorter works. 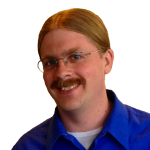 He also leads the Rochester MN Writing Group and is a founding member of the Rochester Writers Collaborative. Book cover and author images available by request.